Life - It is Finished! 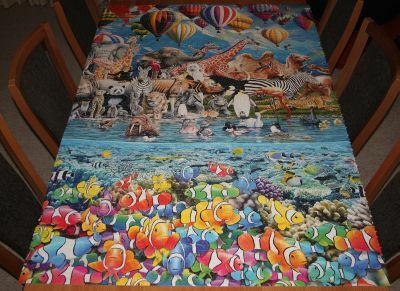 In May 2011 I saw a 24000 piece jigsaw in Games Capital called "Life" and knew I had to get it. 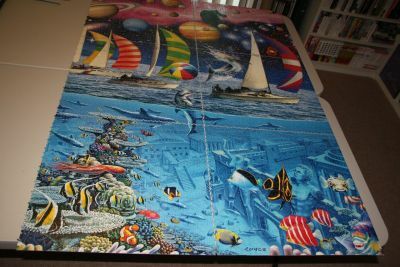 It was once the World's Largest Jigsaw, although by the time I saw it it was relegated to second place behind Ravensburger's Double Retrospect 32000 piece jigsaw. 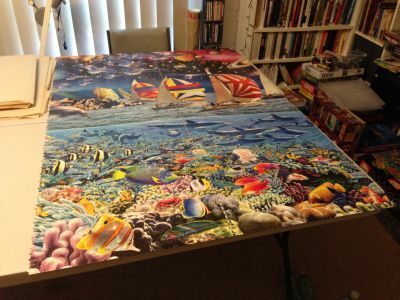 I purchased the jigsaw shortly afterwards for $385 from the Games Capital. I started it immediately on the dining room table. 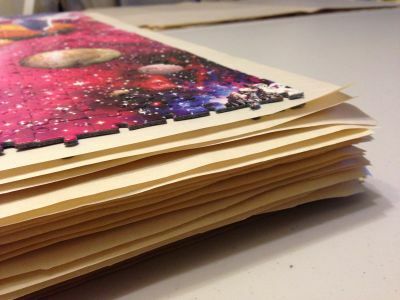 The jigsaw was split into four 6000-piece sections. One section covered most of the dining room table - in fact it hung off the edges just a little bit! I finished part one at the end of June 2011. I had a break from it then, before working on the second section through February 2012. I had another break then, before starting the fourth section in February 2013, finishing up in March 2013. I did it this way because I didn't want to finish up on the blue corner which other people had said was quite tricky. I moved downstairs for this section which gave me a bit more room to work with, but even then it just went off the edges of the table. I finally started the third (and final) section in February 2014 and finished it in March 2014. The puzzle is actually twenty-four identical 999 piece squares. I laid each one of those squares on butchers paper I had leftover from my move to Canberra in 2007. Then I stacked them - 24 high! And there they sat for three and a half years. Anyways with my next purchase I needed to finally assemble the jigsaw and dismantle it. So on the weekend, I finally did it!! I took it into work to photograph it from the floor above. How fricken cool is that! The middle bit is reflecting the light a bit but other than that it turned out really well. It took probably twenty minutes to half an hour to assemble the twenty four sections. And then another thirty to forty minutes to disassemble back into the 999 piece sections and put them into individual baggies. 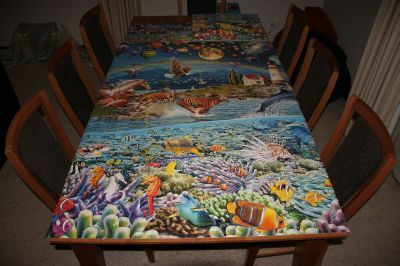 If (when) I do this again, it'll be a lot easier, with twenty four small jigsaws to do instead of four (or one!) large one. That goes beyond “fricken cool.” Nicely done!